The storms of life roll through. Some are natural, others unimaginable. We face them as individuals, as communities and as a world. They bring fear, the courage born from it, and the reminder of what is truly important as we watch our landscape change forever. In the midst of a storm, our animal self is there reacting in the name of survival. The adrenaline kicks in to sharpen our mind and fuels an unconquerable strength. Everything comes into focus. The internal battle recedes with the factions of body, mind and spirit working in unison towards their common good. All hands are on deck. Even the turbulent waters of our emotions become a guiding force upon our keel, propelling us into action and alerting us of danger. Through the flashes of fear and strikes of panic, we sail on, led by that magnetic pull of a compass with its site set on home. Though it may not always look graceful, there is grace. In the alignment of a mind with such clear intent and a body given the right of the conch, we open to a greater force of ourselves— intuition, spirit, God, community. We send out a clear mayday and we are received. We have found our fairway. The aftermath is where our compass can sidle its bearing. As we try to make sense of the storm, asking the why’s and what if’s and reviewing our losses, another storm begins to brew— grief. It is a storm that carries winds of a different kind that blow through our internal landscape, harboring fog, shifting tides, and carrying not only our grief, but that of our neighbors and strangers abroad. Grief is a maelstrom of emotions born in that necessary act of letting go. It can come in waves that wash up the debris of memories—the flotsam and jetsam of shipwrecked dreams—and we mourn them all over again. We weep like rain, howl like wind, and even break into thunderous rage. Then there are the lulls, the moments of reflection that hold a choice: Strand ourselves on an island of silent suffering or set a new course. 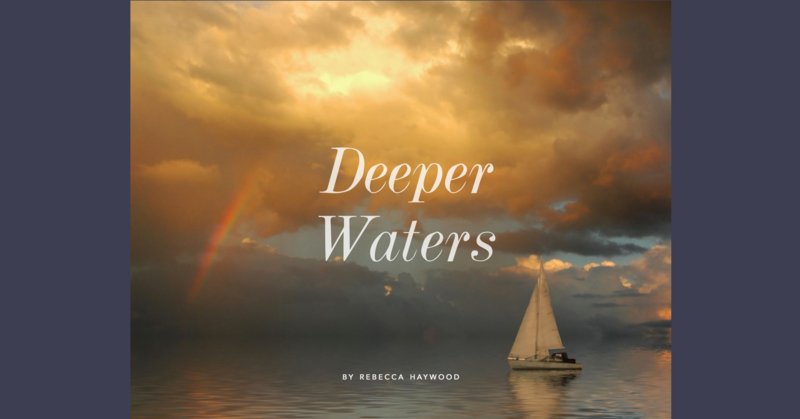 Head for deeper waters. This is what every sailor knows and yet it is counterintuitive. We want to aim our bow towards the safety of shore and its familiar lights flickering on the horizon. The waters of the open ocean hold a mystery that, like our emotions, seems too big to navigate, too far from the known channels of our harbor and the moorings on the lee shore. Yet the deeper waters of our emotions are the only way through this storm. If we embrace them as we did in the name of survival, we will find the same grace, clarity and strength of unity. Between body, mind and spirit, the instigator of mutiny is the mind. We don’t always want to feel what we feel, especially when we have a ship to rebuild. The feelings are inconvenient, distracting, weak, unevolved or even scary, but these are just stories. Your emotions are not the Sirens leading you astray; your mind is. I like to think of my emotions as my internal weather pattern. Just as the earth rolls out her storms, my little planet can roar and crack with anger or weep with a nourishing, soft rain. And just like the earth, these shifts are my body’s way of finding balance. If I allow them, they pass through and I am free to move on. If I resist them, their pressure builds into a greater storm that restlessly circles until it collapses into to the doldrums of depression. Without the mind pirating our emotions, they are free to be what they really are— e-motion: energy in motion. Their nature is fluid, morphing to the changing contours of our landscape. When we tell a story about them, even the simple assignment of a name, we anchor that emotion. It becomes a fixed point in our body that no longer moves with the changing tides. Untether these anchors and you will find fair winds and following seas. Your emotional body will once again be a reliable barometer, guiding you into the blue skies of healing. Your energy will return like the sun upon your face, and the breezes will no longer whisper of what was. In time, your grief will turn to new dreams and even dare to celebrate them. The lulls will linger longer than the storms between and your true course will be revealed. With it, comes a muse far greater than adrenaline’s call to survive— the trade winds of opportunity. Meanwhile, trust that grace is upon you and know that you are not alone. In the Key West way, we are “one human family” throughout the world, riding these storms together. I wrote this article for a Key West wellness magazine, Well. In the aftermath of Hurricane Irma, I was asked to provide tools for the other side of recovery-- the internal one. Whether you are healing from an actual hurricane or another version of life's inevitable storms, I hope this article helps you find the tools you need.